MACOMB, IL – Sigma Lambda Gamma, Casa Latina and the Anthropology and Sociology Club at Western Illinois University will present "Journey to Discovering our Ancestry: Part II" at 7 p.m. Wednesday, March 27 in the Multicultural Center. In Fall 2018, 35 students took their Ancestry DNA test, discussed their expectations about their ancestry and learned how to build their family tree. During the March 27 event those results will be revealed to the students. 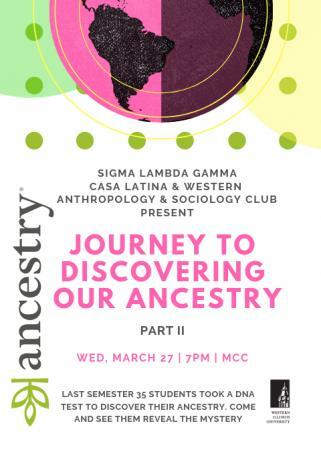 They will also have a discussion about ethnic stereotypes and their cultural backgrounds. For more information, contact Professor Julia Albarracin at J-Albarracin@wiu.edu.